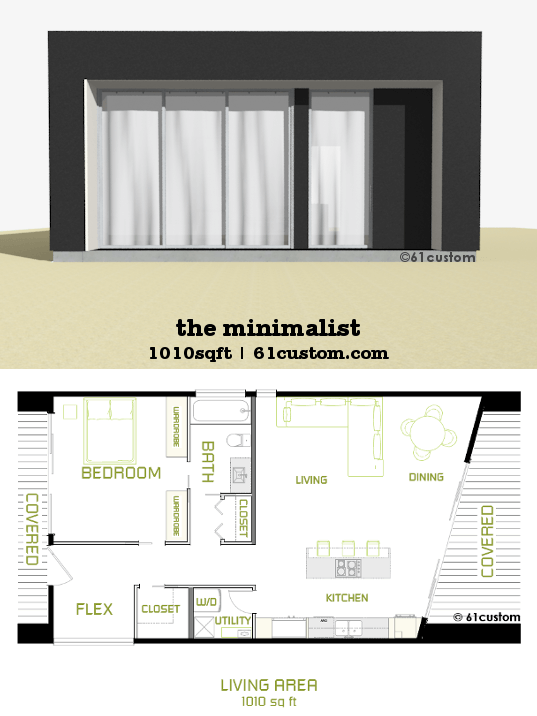 The Minimalist is a small modern house plan with one bedroom, 1 or 1.5 bathrooms and an open concept greatroom-kitchen layout. 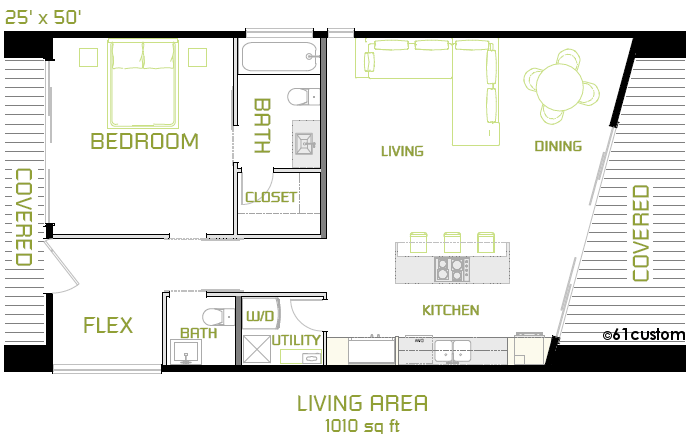 1010 sq.ft. 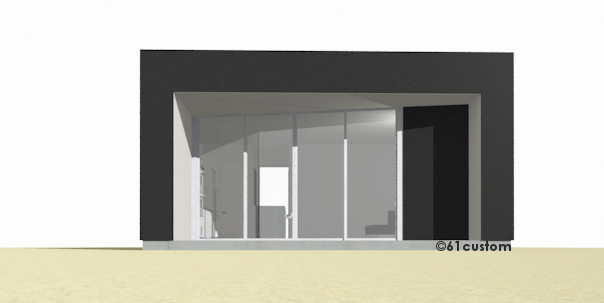 with clean lines and high ceilings make this minimalist modern plan an affordable, stylish option for a vacation home, guest house, or downsizing home. 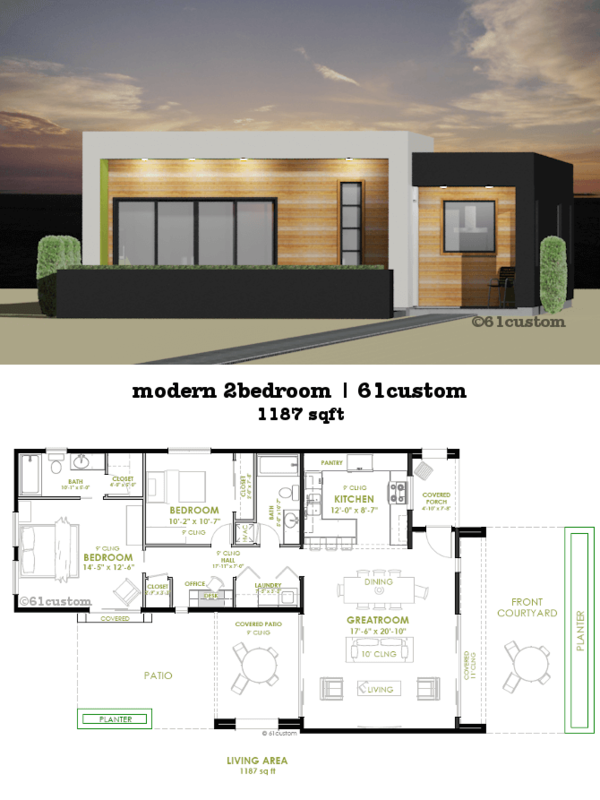 The Minimalist is a small modern house plan with one bedroom, one or 1.5 bathrooms and an open concept greatroom-kitchen layout. 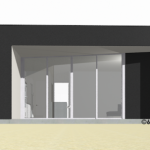 Clean lines, minimal details, and high ceilings make this minimalist modern plan an affordable, stylish option for a starter home, vacation home, guest house, or downsizing. A wide hall allows for easy access, and the flex space can be used as an office, playroom, library, sitting room, or a pull-out guest sofa. The bedroom is filled with natural light and has a walk-in closet and private bath. 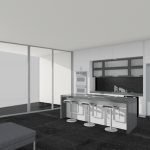 The kitchen features a large island with downdraft cooktop, dual ovens, room for a 42″ built-in refrigerator, and 10′ high floor-to-ceiling cabinets for extra storage. A 16′ wide door opens up the great room to a covered patio that is great for relaxing. 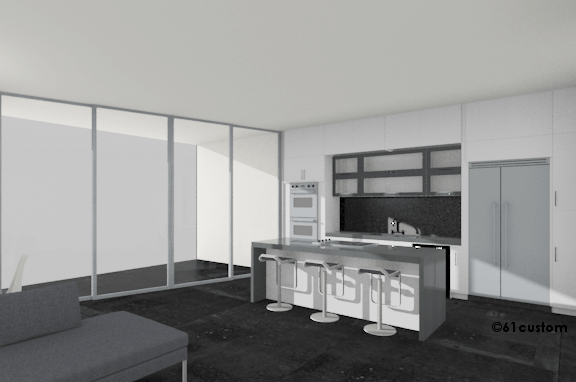 This home is the ideal luxurious, small modern space. Sustainable design features include spray foam insulation for energy efficiency, a tankless water heater, and a rainwater collection system. Modern details include stained concrete floors with no baseboards or casing/trim, exposed hardware sliding barn doors, and a waterfall edge on the kitchen island. 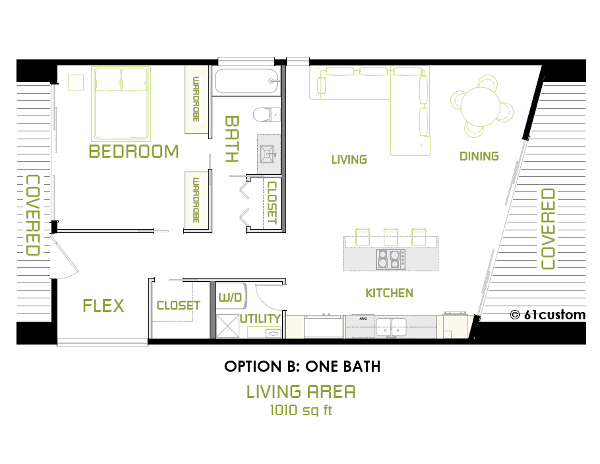 Floorplan Option B includes an additional closet i.l.o. the half-bath, and a reconfigured main bath/closet area. 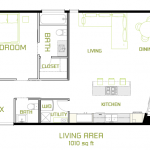 Livable Square Footage: 1010 sq.ft. With the purchase of one license, you can build the house plan one time, or change it and build it one time. You can print out as many copies as you need to in order to build the home one time. All plan sets, including preliminary/study sets, include a single-use license. Awesome, right? Most companies don’t include a license with a study set. Multi-use and unlimited use licenses are available for an additional fee. Contact us for more information. 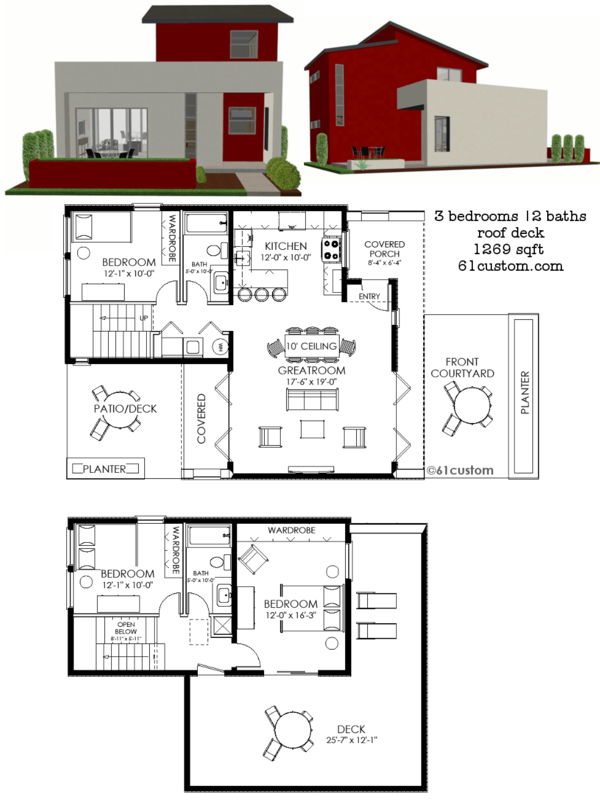 This house plan is available in standard and preliminary plan sets. 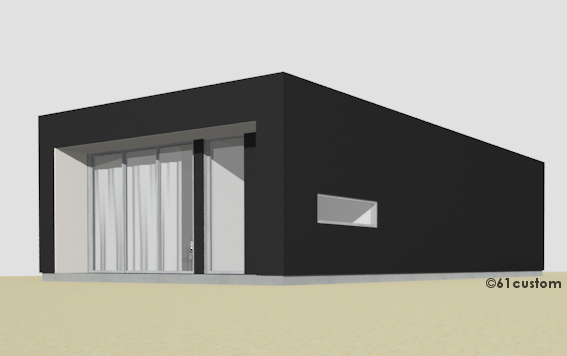 Preliminary (study) sets are available in pdf format. Standard sets are available in pdf and CAD file formats. Standard plan sets include the floorplans, elevations, sections, roof and floor plans, foundation plan, electrical plan, cabinet elevations, and general notes. 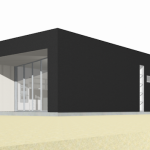 Preliminary plan sets include only the floorplans, elevations and roof layout sheets. Plans print to scale on 24×36 sheets. For more detailed information on what is included with each plan set type and on each sheet, see What is Included in a Set of House Plans? 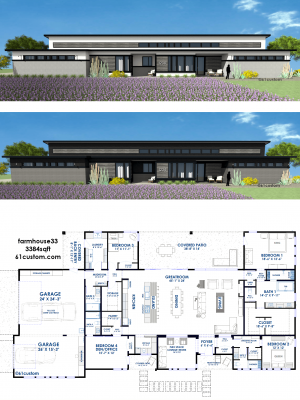 Our house plans are delivered via email in digital format. PDF files can be easily shared with contractors and engineers, and can be forwarded to your local printer for copies (blueprints) printed to scale. 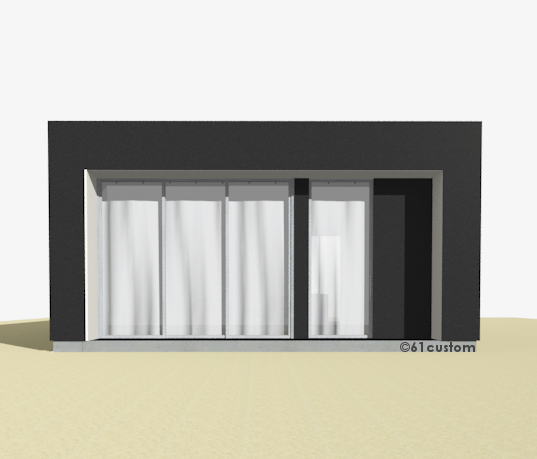 CAD files are also available. 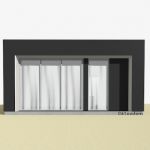 The CAD layers file includes the floorplan, dimensions, and roof layers in dxf or dwg format. 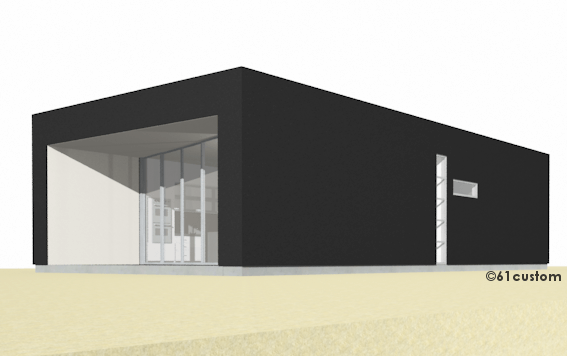 The standard set in CAD format includes the layers file along with CAD files of each sheet of the plans, including sections and elevations, in dwg or dxf format. When you purchase the standard set in CAD format, the PDF file is also included. 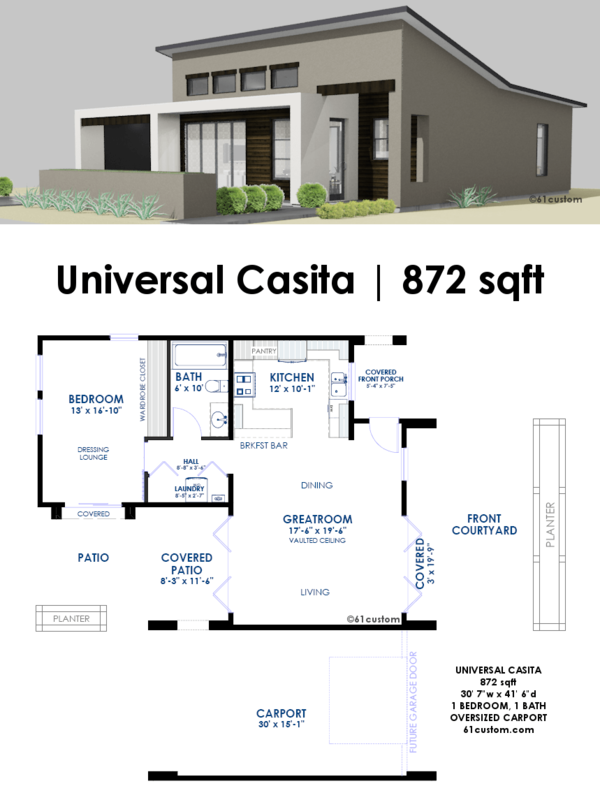 The purchase price paid for a preliminary set of house plans can be credited toward the purchase of the standard set (pdf or CAD format) for the same plan within six months from the date of purchase. 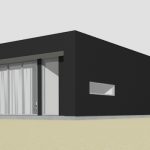 The purchase price paid for a pdf standard set can also be credited toward the purchase of the CAD format for the same plan within six months from the date of purchase. A CAD layers file can be added on to a standard pdf set for a small fee. If you’ve purchased a preliminary set, you must first upgrade to a standard house plan set before adding on the CAD layers file. The layers file is included with standard plan sets purchased in CAD format. 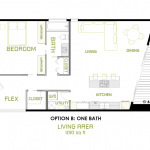 What’s Included in a Set of House Plans? What’s the Cost to Build?